May 13, 2015 ~ Sara W.
This Mother’s Day was particularly rough for some reason. I did my best to hold it together. A couple tears were shed here and there in the morning. Then, we went on a little walk as a family with my dad and step-mom in the afternoon. It was then, as I was hugging my dad goodbye, that I lost it. I didn’t want to let my daddy go. It was Mother’s Day and I wanted to be on the kid end of the day. I wanted to celebrate Mother’s Day as a daughter. Thankfully, I was able to hang on to my dad for a bit and cry while my husband took the kids and got them in the car. Prior to losing my mother, I believed that the pain and emptiness of losing a loved one was due solely to their being gone. I’ve learned that you also end up mourning the role you played in the relationship. I am no longer a daughter to a mom, but fortunately, I still get to be a daughter to a dad. I had never given it much thought until I stumbled upon a book that dealt with grieving. Sadly, I have no recollection of the title or author. What I do remember is that both of the author’s parents had passed away. She spoke to the fact that she was no longer someone’s daughter. I remember standing in the middle of the book store and thinking, “Thank goodness I still get to be a daughter to my dad.” I’m not ready to stop being a parents’ child. Being a daughter means different things in different families. I played a large role in my mom’s life, as she had not remarried and we had always been particularly close. I did my best to be there for her whenever she needed me. I made her my priority. I don’t say this to boast, but just to express how much my role as a daughter to my mom made up my identity as a whole. Though my relationship with my dad is a strong and healthy one, he remarried after my parents’ divorce and my role as his daughter is less involved. So, while I am still a daughter to my dad, I continue to struggle with understanding the missing piece of me that was devoted to my role as a daughter to my mom. But, as the quote says, “At some point…we cease to be our parents’ children and we become our children’s parents instead.” That’s certainly the case for me. My role as daughter, whether to my mom or my dad, has taken backseat to my role as parent. It’s a demanding role, that doesn’t leave much room for lack of responsibility and vulnerability. As a mom, I am called upon to be the strong one when my kids face trials or heartbreak. I am the one that is meant to offer comfort. I am the one that is supposed to have my act together. While I am grateful for my role as a mom, I have not lost my desire to be a daughter still. Sometimes, I just want to be the kid. This past Mother’s Day was one of those days. I wanted to have my dad hug me, tell me he loves me, and assure me that it’s gonna be alright. And he did, as he has done several times in my life. Our role as a child or a parent is a huge part of our identity. I think my reason for sharing this topic today has more to do with me processing that concept than it is me trying to provide some sort of inspiration. As I mentioned, in losing my mom, I was misled in thinking that my pain came only from the loss of her. When she passed away, I also lost a part of me. Acknowledging that fact and allowing me to mourn that loss, helps me to heal. Thankfully, I still get to be a daughter to my Dad. It’s not just that I still have my Dad around, though that’s a blessing as well, but that I still get to be “our parents’ children.” I can still cry into the shoulder of a parent who has known me all of my life and has watched me grow through all of my trials. I hope that I can be for my kids, what my parents have been for me. 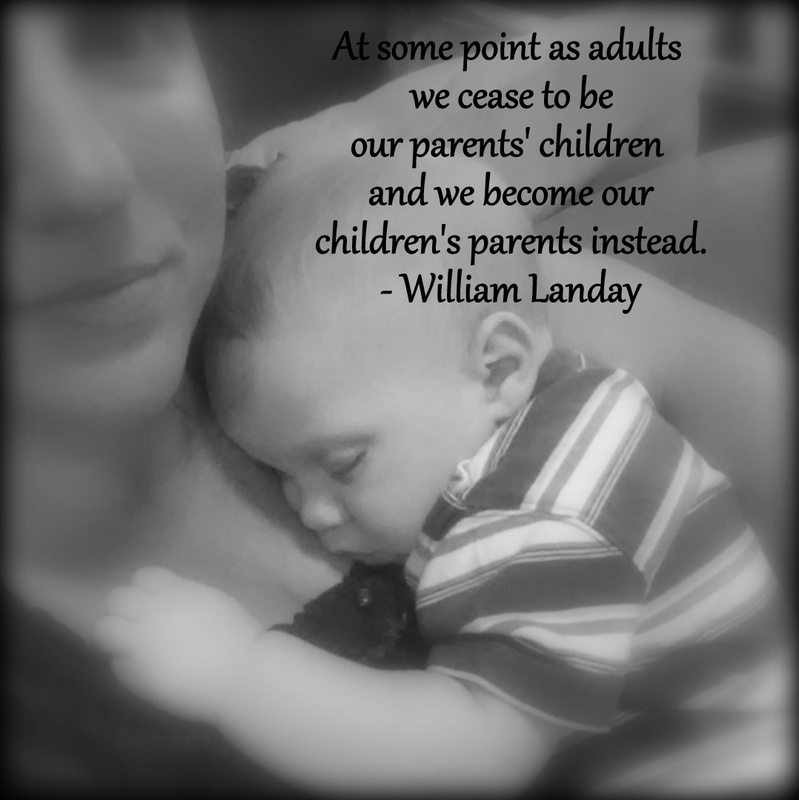 As true has Landay’s quote feels, I think I’ve decided I don’t want to cease being “our parents’ children;” I want to be both! I suppose it’s a good thing that I believe in eternal families, as it provides me the opportunity to be both the child and the parent without end. This nearly made me cry. I’m sorry you had a rough Mother’s Day. I get what you’re saying, but, once a daughter, always a daughter, whether they are here or not. “No longer” doesn’t mean “never was.” But I know you know that. Love you. This is a beautiful writing, Sara. Love you.